Ashley, Valerie, Lori & Selena hasn't added a story. As consultants for Usborne Books & More, we are seeking your help to raise funds to provide at least 400 new, engaging books to the Hill Country Needs Council in Fredericksburg, TX. Santa is coming to visit on Saturday December 17th and will be gifting books to children of 80-100 families needing assistance this holiday season. In addition, the Hill Country Needs Council can utilize books when providing ongoing services to families they are servicing. Because Santa is coming very soon, this is a quick 48-hour book drive so we'd like to ask you to please consider donating right now as well as sharing our message with your friends and family!! Your donations will go directly to purchasing books and because of a 50% matching grant from Usborne Books & More, your donations will go even further!! Every donation amount helps, and any amount is more than welcome. 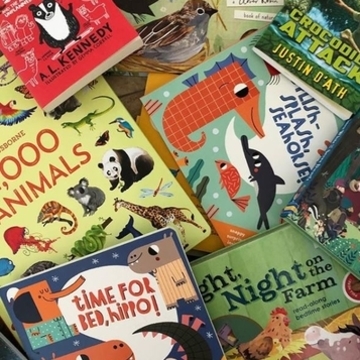 We are passionate about our mission to get Usborne and Kane Miller books into the hands of as many young people as possible, and with your help we will be able to provide some much needed support to our community this Christmas season. Thank you!! Ashley, Valerie, Lori & Selena hasn't posted any updates yet. Ashley Crane is managing the funds for this campaign. The campaign is for a personal cause.